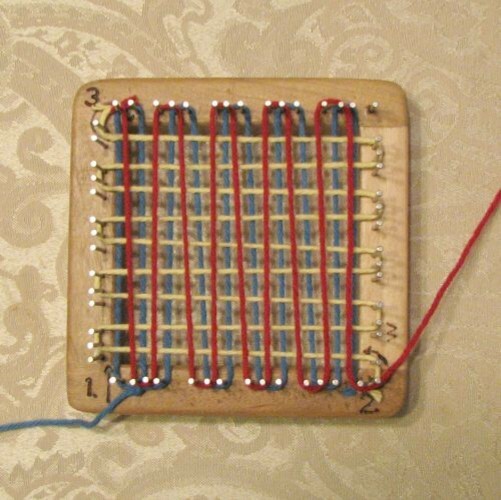 Pin loom weaving is becoming popular again! I have been intending to write up some instructions to help clarify questions from our pin loom customers. It’s not perfect, but here it finally is – a photo tutorial of how I warp and weave on the Blue Butterfly Pin Looms. The two-year-old desperately wanted to help, so I was a little distracted, and photographed a few hiccups, but between the photos and the text, you’ll be in good hands. I used the four inch square for this tutorial, but this method and pattern (skip one pin, around two, etc.) works on all the sizes, and on both squares and rectangles. I used four colors of Peaches and Cream cotton yarn. I tied on a new color for each layer, so it is easier to see what each individual layer does (You will skip the cutting and tying, and just work with the same yarn throughout). The cotton makes a rather loose square when done, but that same quality is what makes it so easy to see what is happening on the loom – perfect for this tutorial. But for regular weaving, I recommend wool or acrylic. Normally, I use knitting yarns, either worsted weight, heavy worsted, or two strands of sock yarn held together. I have played with other materials, just to experiment (ribbon, t-shirt strips, crochet cotton), but the easiest material to learn on, in my opinion, is worsted weight yarn. 2. Second layer – Yellow. Turn the loom clockwise. Note that wood burned 1 is now on the upper left corner. Continue the pattern. Go around two pins on the bottom, skip a pin on the top, go around the next two pins. Skip a pin on the bottom, go around the next two pins. With this second layer, you will end at the top, by the 3. Again, ignore my hiccup, and go *between* the last two pins, following the arrow. 3. Third layer – Red. 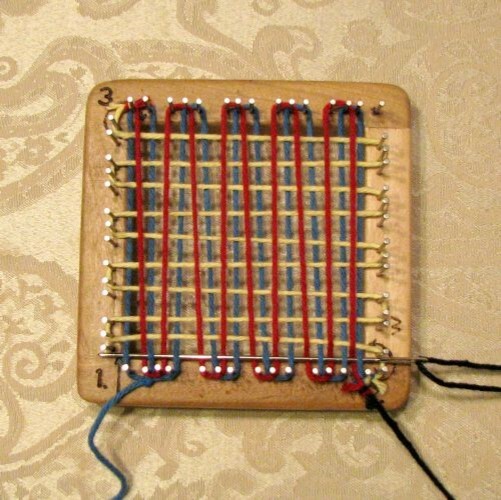 Turn the loom back counter-clockwise, so the 1 is again at the lower left-hand corner. Following the woodburned arrow by 3, come down between the first two pins in the upper left-hand corner, go to the bottom, skip a pin, and go around the next two pins. Go to the top, go around two pins, come to the bottom, go around two pins. Continue until you reach the lower right hand corner by 2. Notice that on this layer you go around two pins, skipping the third pin in each group. 4. Fourth layer – Black. Wrap 5 times around the pins to measure out your weaving strand. Cut it a few inches from the loom, and thread on your long weaving needle. 5. Time to weave, and lock those layers together! You will go between the first two pins on the bottom right-hand side. Take your needle over the strand that is OUTSIDE the pins, and then under the first strand INSIDE the pins. Continue going over/under strands across the loom. You will come out below the first pin on the lower left-hand side. Repeat this process up the loom. I like to turn the loom around, so I am always working from right to left. If you are left handed, you may prefer to turn the loom so you can weave left to right. You will always start by going OVER the strand that is OUTSIDE the pins, and UNDER the strand that is INSIDE the pins. When you end, you will be at the corner of the loom that is not numbered. Go around that lone pin, and tuck the yarn back into the weaving, and to the underside of the loom. You can remove the weaving needle now. Pop the square off the loom. I like to push it up from below, and work my way around the square. 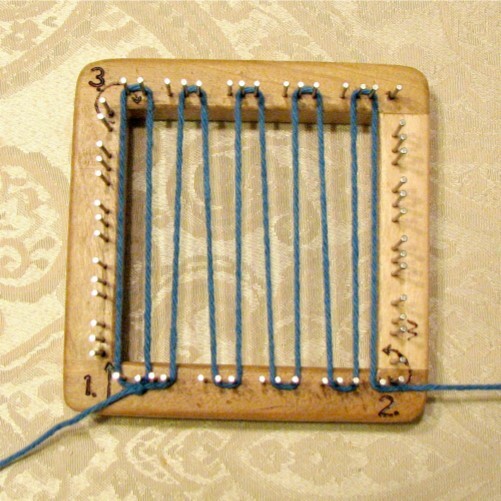 Once your square is off the loom, you can thread a 3″ tapestry needle and hide the two ends. 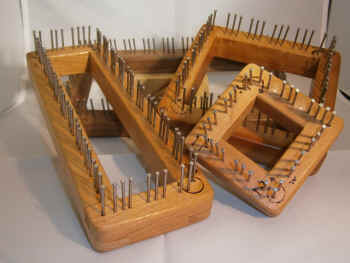 Some pin loom pros do not cut these tails, because they have planned for these ends to have enough excess that they can use them for assembling the squares. That’s all there is to it, for your basic plain-weave square. I strongly recommend weaving 5 or 6, or whatever number it takes so that you can do it without referring to the directions. 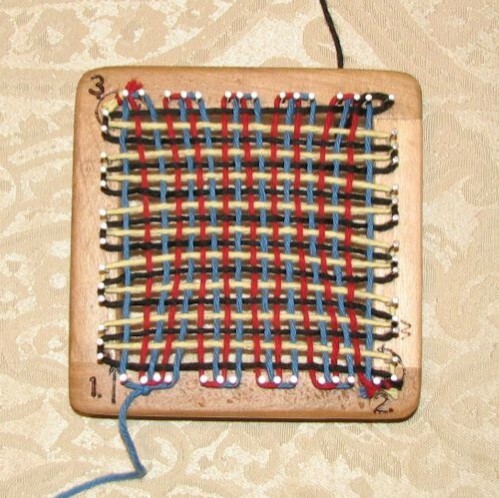 Then you are ready to branch out and try some patterns in your pin loom weaving! 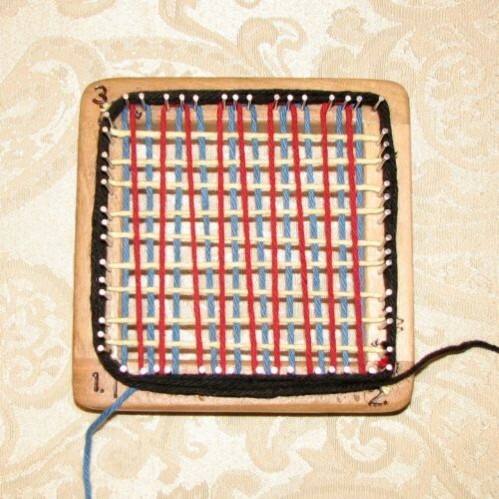 eLoom a Nation – many PDFs of old loom manuals, including a tutorial on weaving texture in two colors. 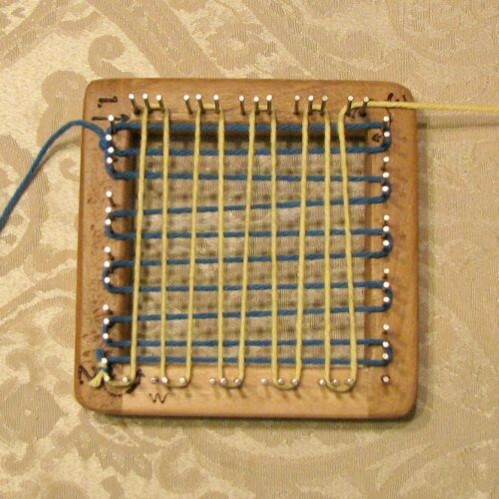 What patterns and materials have you used in your pin loom weaving? I’d love to hear about it! Dryer Ball Tutorial - How to make your own dryer balls! Top This Monkey! Using Top This! Yarn to make easy stuffed animals. Thanks for the tutorial. Very clear. You are welcome. I’m glad you found it helpful. I feel a little stupid answering a question no one else is asking, but when you weave, do you go u/o all 4 layers to include the lowest level, or just u/o the top two layers? Ask away! 🙂 That is what we are here for! 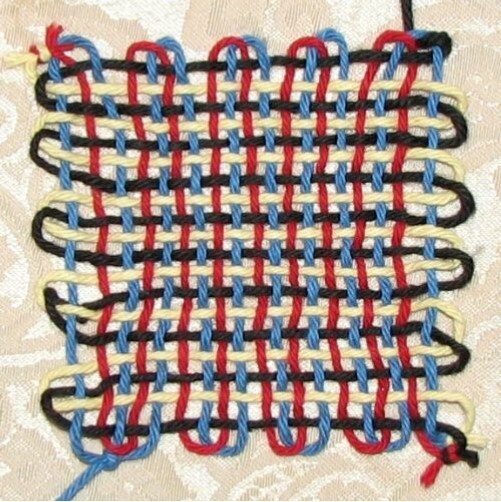 You are technically going over/under the first layer (blue) and third layer (red) which are vertical, which creates the fourth layer (black) and locks in the second layer (yellow), which are both horizontal. Thank you! My loom from you should arrive Monday or Tuesday, I can’t wait! I have so many ideas, and sooooooooo much handspun yarn to use. ?